Phoenix Family Foodie Blog: Leftover Challenge! What do you do with your leftovers? Live Richly e-magazine is challenging us to compare notes this week. Leftovers in our house are either lunch for Daddy the next day, or even better, in our breakfast with scrambled eggs the next morning! Daddy is the self-proclaimed "breakfast master" in our household, so seven days a week, he's always the first to fire up the burners. In a large mixing bowl combine ground turkey, eggs, bread crumbs, 1/2 cup parmesan cheese, parsley, milk, ketchup and garlic. Mix well with your hands until all ingredients are combined. Season with salt and pepper and combine. Heat olive oil in a large skillet. Using a melonballer, form mini meatballs with the ground turkey mixture and cook in the skillet on medium heat for 4-5 minutes on each side until brown and cooked through. Cook the meatballs in batches if necessary. 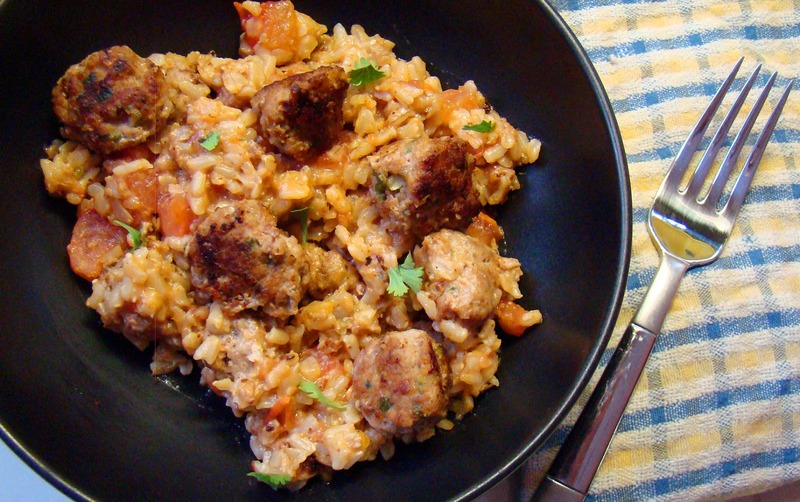 When meatballs are cooked, add rice and chicken broth to the pan, deglazing the bottom of the pan with the chicken broth. Add tomato, remaining parmesan cheese and basil. Stir to combine and serve immediately. The leftovers are easy. 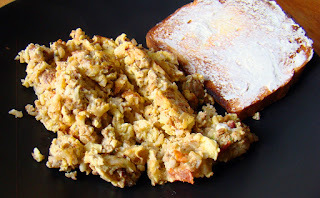 Heat the leftovers up in the pan the next morning, add scrambled eggs and combine! Daddy was thoughtful enough to snap a photo of his masterpiece, and even finished it off with a piece of Philly coated toast! I'd love to hear what all of you do with your leftovers! Oh, Michael my FAVORITE leftover dish is cold meatloaf shoved between two pieces of bread with mustard !!!! Great minds think alike! Hoop I saw your comment, I don't ever mind if you want to post a give away shout out on your blog of mine. I do that sometimes when I see a real good one I am entering too.